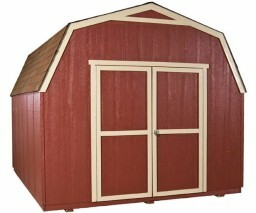 This 12x8 shed is the ideal storage solution for anyone looking to make their weekend projects much easier. We included a 12ft. wide shelf so you can keep items organized and off the floor. We even added a storage loft for extra overhead storage of seasonal items. As you move lawnmowers, tractors, wheel barrows and bicycles in and out, you will love the extra wide 64” double door opening. Weekend warriors can rejoice as the sidewalls are 6ft. 4in. tall, so organizing your long-handled gardening tools and equipment is easy. To top it all off, the window with shutters add a distinctive charm while letting natural light and fresh air in. With all that this 12x8 shed has to offer, it could make the perfect man cave, she shed, gardening area, art studio or workshop. The only limits are your own imagination. Alternative use Ideas: Storing stuff in your shed can be boring, why not convert your 12 x 8 shed into a workshop, man cave, she shed, gardening area, hobby room or artist studio. With many functional and decorative accessories to choose from, no design idea is out of reach. Your local building authority may have specific requirements resulting in additional cost. Prices do not include painting, staining, permits, zoning and setback advice and/or compliance, excavation, or leveling beyond 6". All prices and content are subject to change without notice. Promotions are valid with online transactions only and cannot be used in conjunction with promotions at a servicing sales/distribution center or distribution center. Not valid on prior purchases. All stated sizes are nominal dimensions and approximate. Some outdoor storage buildings may be shown with optional items. Additional mileage charges (if applicable) and taxes will be calculated after checkout process is completed. 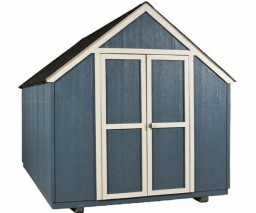 Painted 12x8 wooden shed is a representation only, arrives primed for painting in a light beige color. 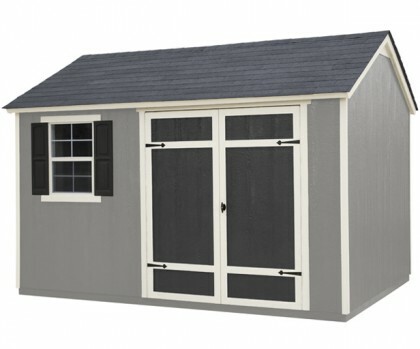 Purchase shed 6 months ago billed me before it was installed. Quick to set up delivery and install. Month away could live with that, 2 days before install called can't make it, had already set vacation to be there. Called next day said they would be there in 3 days at certain time. Did show on that day 2 hours late. Installers did great job of building shed, said it maybe last going work for another shed company. Also shed that I order should of had shutters didn't get called install company got the run around, left several emails, no answer. Now I get email to write a review, shutters would nice. Overall, well pleased. They showed up on time on the scheduled day, worked hard, non-stop all day. Finished by evening. Only complaint: the handle/lock on the door was faulty and did not work. I was told he would report it & they would be back the next day to replace it. Two days later I called & was told they would be out the next week. I called back the next week after the date that they were to be there & was told they needed to order a new handle. Finally, a month after the installation they showed up with a used handle from another shed & replaced the faulty lock. They only brought 1 key. I love my shed. It is everything I thought it would be. It is spacious and sturdy. They delivered and installed it on time and it is fantastic! we love our shed thank's. Bought the shed almost two years ago. They came and constructed the shed on my prepared site in about 4 hours start to finish. The workmanship is good and materials quality is good as well. I expect it to last as long as the house does. Atlantic the shed basis was leveled. The shed is now 1.5 yrs old and everything is in great working order. I was very impressed with Chris, he installed my shed. It is well built, looks great, more storage than I thought, he cleaned up after himself, very professional. They builder, Mike Files, was just amazing. He was so thorough, efficient, and quick, we felt like this was the best experience we ever had with this type of project! We would recommend him to anyone! 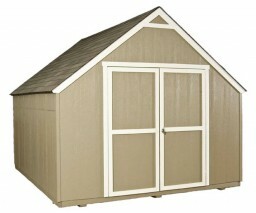 I decided I needed a shed for my gardening supplies and the pool we were adding to our yard. I shopped around a lot, and was thrilled to find this shed with Shed Liquidators. It add all the features I wanted, and I even added a few more for the list of options. The company was very easy to work with, even when I had to change the installation date a couple of times. The installers were fantastic, too. 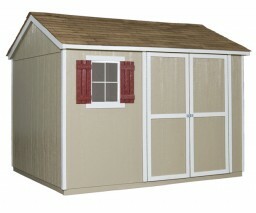 Now all my yard stuff and pool stuff is organized, in reach, and my shed looks like a charming little cottage. I just love it!